Casa Rossa is a Tuscany villa in the beautiful Chianti region. Set atop gently rolling hills of vineyards and olive orchards, Casa Rossa is a peaceful Tuscany villa retreat that typifies the beauty, serenity and charm of the Chianti Classico region. The villa is located in the countryside between Florence and Siena, The nearest towns are San Casciano and Tavarnelle in Val di Pesa. Florence, Siena and Greve in Chianti are an easy drive. Casa Rossa or 'Red House' is a restored farmhouse set off a small country road on an estate that produces a lovely Chianti wine from the robust San Giovese, Malvasia, Trebbiano and Canaiolo grapes grown there. Additionally, the estate grows olives that are pressed into an excellent extra virgin olive oil. You approach the front door of the Tuscany villa from a short flight of stairs. The living room and kitchen are to the left off the main hallway; the bedrooms and bathrooms are to the right; all of these rooms are on one level. The living room is comfortably furnished with a beige sofa and two comfortable easy chairs. In the corner is a television, but with views like these it's unlikely you'll spend time watching TV! The sofa opens up to become a double bed. The country-style open plan kitchen flows from the living room, perfect for friends and family who want to socialize and cook up a savory meal together. The dining table provides a great place to congregate and enjoy a relaxing lunch or dinner. The table expands to seat 6 people comfortably. The kitchen's 'piece de resistance' is the beautiful original wood burning fireplace that truly makes it the hearth of the home. It's a very pleasant room to spend time in while you make a delicious Tuscan-style meal from the fresh ingredients in abundant supply locally. It has a refrigerator with freezer, a four-burner stove, corner double sink, and a buffet serving area. The many cabinets provide good storage space. The countertops are covered in clean off-white tile. Just off the kitchen is a small room that contains the washing machine. Off the living room is the large terrace with views galore. Enjoy your meals al fresco throughout the warm months. What better place to relax and review the day's events, or simply enjoy life, than lounging on the expansive terrace? The terrace is furnished with eight chairs, two lounge chairs, a table, barbeque and an umbrella. Just below the terrace the vineyards stretch out and down the gently rolling hillside. Retracing your steps back down the hallway past the front door, there is the main large bathroom to your left. It has a large Jacuzzi-style bathtub for long soaks, a sink with good countertop space and storage in the cabinet underneath, a bidet and a toilet. Beyond to your left is the large master bedroom with a lovely wrought iron framed queen bed, antique armoire for clothing, nightstands on either side of the bed with small reading lamps. The ceiling rises high above with exposed beams and tiles. In the morning throw open the shutters and take in the fresh country air. Across the hallway is the second bedroom with an en suite bathroom. It has two comfortable twin beds each with a nightstand and small lamp for nighttime reading, an armoire for clothing and two windows that overlook the property. There is also a rollaway twin bed so the bedroom can sleep three people. The bathroom that connects to the second bedroom is small but convenient. It has a sink, toilet and shower and bidet. The bottom part of the house has a small room that is used for winemaking during the grape harvest and is not accessible to guests. We will happily arrange, upon request, to show you the large cantina below the house where antique aging barrels are still used today during the autumn vendemmia - grape harvesting season. We hope you'll oblige and try a bit of the very nice Chianti that is produced on the premises! The house is located on the same property with another rental house, Casa San Vito VRBO #42825, which can be rented in conjunction with Casa Rossa for large groups. The houses are approximately 30 meters apart. The Chianti location in one of the most scenic areas of the Tuscany region. Casa Rossa is located at the western edge of the famous Chianti Classico region in Tuscany, between Florence and Siena. About seven miles away is the ancient hilltop town of San Casciano in Val di Pesa, located between the Greve and Pesa valleys. The town is surrounded in part by an ancient wall dating back to the 14th and 16th centuries and has many restaurants, shops and a two supermarkets. A car is essential for this location. 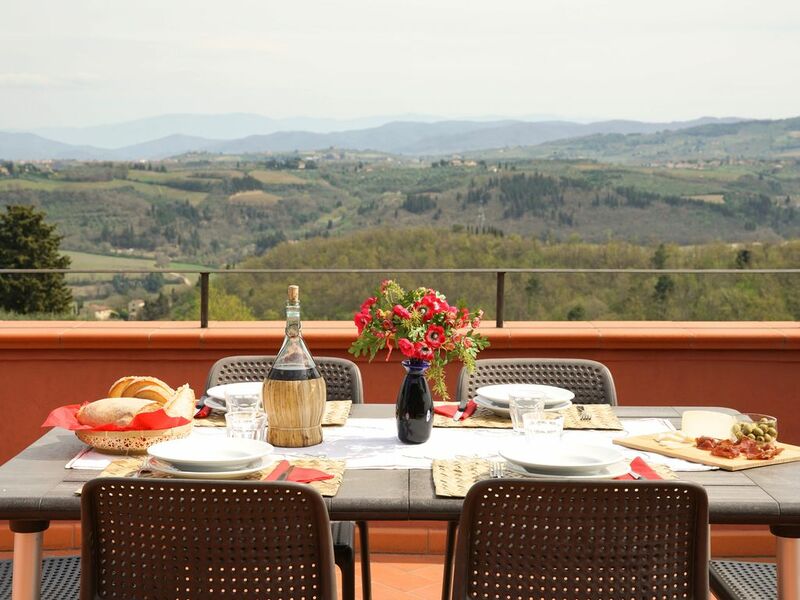 Terrace has spectacular views of rolling hills & valleys of Tuscany's Chianti region. Heat paid at check out based on your usage. We absolutely loved staying at this vacation rental . The location of the rental is perfect for exploring Tuscany and the surrounding areas. Anything needed to make the stay comfortable was provided and communication was great. The view from the balcony is beautiful , also from the bedrooms . Wonderful and helpful host , we were definitely impressed ! I had initially planned on staying 11 nights here with my family, but left after only 5 nights due to the bad condition of the house, and spent almost 1,000 euro to relocate for the remainder of the trip. - Amazing location for exploring every part of Tuscany; Firenze, Siena, Montepulciano and Pisa are all within a short drive. - The views from the large balcony are amazing, especially at sunset. - There is a fig tree in the yard that offers fine figs when in bloom. - The bathrooms were the cleanest parts of the house, containing only a few cobwebs unless one looks at the ceiling. - The house has the worst upkeep of *any* property I’ve stayed in, and being a traveller by profession, this is a staggeringly long list. - The amount of dust and dirt inside the house, as well as cobwebs is significant. God know when it was last properly cleaned and mopped. - The furniture is old, which would not be a problem if it was properly cleaned and up-kept. The wardrobes stunk of old mildew and we kept our clothes in our suitcases because of that. - This all made it feel very shabby. - Many mosquitoes and spiders, etc. made their way into the house; many such carcasses were squashed on the walls when we first arrived, and this number only increased throughout five awful sleepless nights and tens of mosquito bites to boot. - The first floor remains unoccupied and may very well be a breeding ground for anything and everything, and being one house I’ve a feeling that many of the bugs migrate upwards from there into the second floor when humans are present. - NOTE: I know that these bugs exist, but it is not normal for them to enter a house without human intervention. - The mosquito netting on the windows does not sit flush when rolled down. - We were provided with only one garbage bag, one kitchen towel roll, and two rolls of toilet paper for 11 nights. - The ironing board and iron were broken; the iron was replaced two days later but the board was never acceptably dealt with. If the owner cared as much for the state of the house as he does for the money it brings him, it would be a truly idyllic place. Unfortunately it is at the point where a thorough dusting would do it well, but years of neglect may now require a more serious restoration. As attested by our 20+ 5-star reviews this review from Martin is completely inconsistent with the experience of all our past guests. Martin contacted us a few days into a 11 day stay to tell us that they had to leave early due unexpected family reasons and asked if we could refund the remainder of his stay. We were not able to refund as clearly stated in the terms. Because no refund was possible he wrote his review in retaliation. Please see our other reviews and we are happy to email you the image of his happy texts during his stay. Throughout Martin's stay the property manager was in touch with him via text message, providing helpful tips about local markets, answering questions about sites, and Martin assured him all was fine with the exception of the iron and ironing board, which were promptly fixed. The only other issue he raised was that there were wasps outside on the terrace. If you have ever been to Italy you'll know that wasps are to be expected throughout Italy during warm weather. The property manager came and sprayed the wasps at Martin's request. The house is clean, as our other guest reviews verify. The first floor is the private winery, it is not as he depicts. As far as supplies this is a self-catering villa: we provide enough soap, toilet paper towels, laundry detergent the first 24-48 hours, as he was informed upon booking as well as complimentary wine, olive oil produced on the premises and fresh fruit, which his review carefully neglects to mention. We hope other travelers will look at our many excellent reviews and understand that this guest is not credible. If you want privacy and beauty but don’t want to be in the “boondocks” then Villa Rossa is perfect. Comfortable and simplistic in an enchanting setting. The owner Francesco is the proverbial new friend who feels like an old friend. We will be going back! We so enjoyed staying at Casa Rosa for the following reasons: We loved getting the fresh foods and vegetables in a nearby market, cooking in the kitchen, sitting out on the villa's large terrace in the evening to drink wine and eat dinner, the long (1.5 hours) walks up and down the road that led to our villa (morning exercise), the beautiful wine vines that were very pregnant with grapes, taking day trips to nearby towns like Siena, lunches and trips to nearby wineries, making friends with, and joining up with, the "wild and crazy" Canadians in the villa next to us for drinks and dinner, discovering the tomatoes and apples in the garden area, the rain showers that helped to reduce the temperature (which was unexpectedly warm during our visit), the ease of parking in the lot directly across the street from our villa, the fresh air upon opening our windows and shutters, the great food and wine at nearby restaurants, the beauty of the terrain and sky (we even saw a double rainbow!!) from our terrace, the complimentary bottle of wine and bottle of olive oil, and the tremendous hospitality of all the Italians we met, and especially the hospitality of our villa host, Francesco.